GeoSurf is a helpful proxy toolbar service developed by BIScience. This toolbar and product suite are supremely helpful if you need to “surf like a local.” In other words, if you need to see what a given site or service looks like from a geographic location other than your own, this service can make that happen safely and securely. Quite simply, GeoSurf offers a toolbar and VPN for replicating what web content looks like when viewed in different countries around the globe. What sets GeoSurf apart from the competition is their proprietary Automatic Bandwidth Optimization system. This ensures that your browsing experience is fast, fast, fast. One thing that is really nice is that you can get more specific than just one part of the country. For example, you could compare how a given piece of web content looks in Dallas, Texas versus Las Vegas, Nevada, or compare Sydney to Perth. 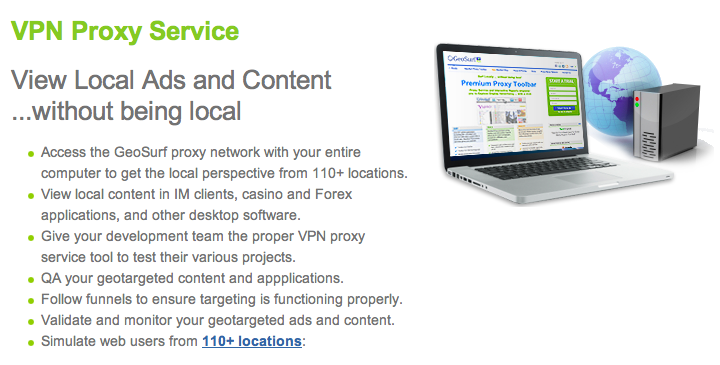 When you use GeoSurf, you can get access to premium proxy servers from over 110 global locations, allowing you to access geo-targeted local content. Worried about security? You can take comfort in the fact that GeoSurf owns all of the servers on their network and hosts them in Tier 1 backbone data centers. The user interface is super simple, and pretty darn comprehensive. In addition to their other offerings, you have the option to automate your global data analysis and QA with GeoSurf’s Direct Connect API. Granted, the service can get a little pricey. However, for such a robust and secure service, it’s worth every penny to sign up with GeoSurf. If you’re developing a website, game, or marketing initiative with a global reach, GeoSurf’s toolbar and VPN are invaluable tools for replicating the end-user experience. Want to see GeoSurf in action? Check out the demo video here. GeoSurfis compatible with Internet Explorer, Google Chrome, Firefox, Android, iPhone, and iPad. If you are looking for a solution to use GeoSurf on other browsers or Desktop applications, the toolbar makers also offer GeoSurf™ VPN.